The lineup at CES 2018 has been dominated by the inclusion of voice assistants. While Amazon’s Alexa and Google Assistant are the major leaders here with a plethora of products integrated by these AIs at the show, Samsung has also taken some steps to push the envelope on Bixby. The company has already introduced its Bixby powered Smart Fridge Hub, AKG Speakers, and Smart Home Controls. Now, it is also planning to attract more consumers to its mobile platform by upgrading Bixby Vision. Bixby Vision is essentially Samsung’s take on the Google Lens and this smart AI tech can identify objects by looking through the camera lens and matching them with an online database. 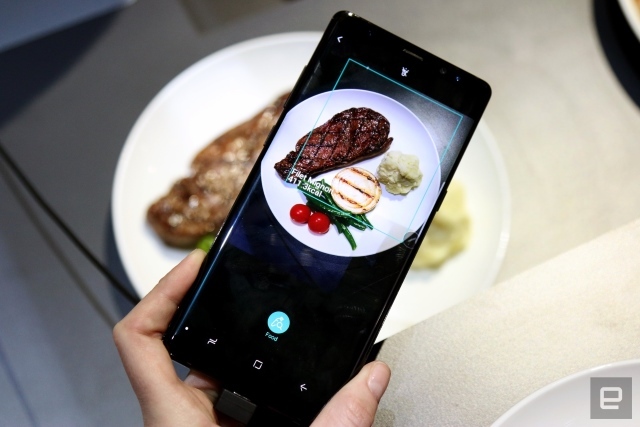 The company is integrating a new feature that will allow Bixby Vision identify your food, and give you approximate calorie count. Still in its testing phases, the service seems to be performing quite well. As reported by Engadget, the feature was able to easily distinguish between various food items on the table, while giving a calorie count of each item. That being said, the user has to capture each food item individually. The company’s representative state that Bixby will be using “generic data” for food items, thus calorie counts are expected to be off the mark by a few counts. That being said, as compared to MyFitnessPal, Samsung’s solution is definitely much faster and convenient. Furthermore, the data measured by the app will then be stored in the user’s profile in the Samsung Health app, which will allow the user to monitor their calorie intake. The feature is still in its testing phase and there is no word as of yet as to when – or even if – the feature will make its way to consumer devices. That being said, even as a prototype, it does sound like an interesting addition to an already capable smartphone assistant. What do you think of Bixby’s new feature? Let us know in the comments down below.